These marriage allegations were taken out a few days before marrying to allow a marriage at short notice or outside the parish of residence and certainly without public reading of banns. I have obtained a few of these from the Society of Genealogists' collection and thought that this was particularly worth displaying as this marriage was the foundation of our cadet line of the Powyses. but it is 1650 kbytes of file! Which day appeared personally Phillip Powys of Isleworth in the County of Middlesex aged twenty one years and a Batchelor and allegeth that he intends to marry with Isabella Lybbe of Hardwick in the County of Oxford aged sixteen years and a spinster by and with the consent of Isabella Lybbe of Hardwick aforesaid widow the natural and lawful mother of the said Isabella Lybbe spinster ... prayed licence for them to be married in the cathedral church of St Pauls London or the parish church of St Bennett Pauls Wharf London. 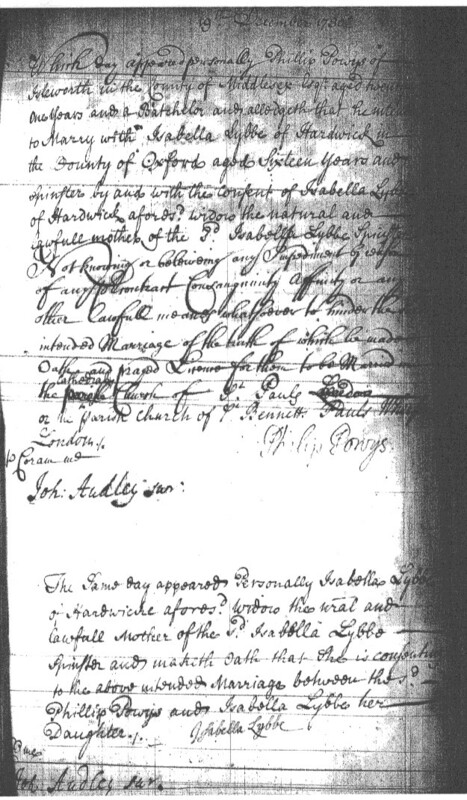 The same day appeared Personally Isabella Lybbe of Hardwicke aforesaid widow the natural and lawful mother of the said Isabella Lybbe spinster and maketh oath that she is consenting to the above intended marriage between the said Phillip Powys and Isabella Lybbe her daughter. The date of this licence was 19th December so it is not likely that they were married on that day, probably a few days later judging from other such licences. Note: As of Dec 3rd 2009, I have found this was incorrect, they did marry on 19th December. See the trancript from the register for St Bene't's. I wonder if St Bennetts was not truly the parish church of Doctors Commons, hence the naming in some documents? The handwritings of the two paragraphs are completely different, yet both are countersigned by John Audley junior, presumably the Adminstrator. An initial thought was that each signatory had written their own paragraph but the incorrect spellimg of 'Phillip' clearly denies this. Curious.